St Mary’s church, Letchworth, a couple of miles from the busy (if dull) modern centre of Letchworth Garden City, is a peaceful, tranquil place. It is hard to believe, while strolling around the churchyard, that the quiet, now disturbed only by the distant sound of an occasional passing car, hasn’t lasted forever. But it hasn’t. One hundred and eighty years ago the church and churchyard were rattled by the strange activities of one of Britain’s least known eccentrics. In 1838 the recently widowed Reverend John Alington (born 1795) moved into Letchworth Hall, immediately next to the church, to take up his newly acquired role as, effectively, Lord of the Manor. He was 43 years old and a very wealthy man, having inherited the estate of John Williamson, his maternal grandfather, a malt dealer and later banker who had accumulated a fortune and property empire in Hertfordshire and Bedfordshire through hard work, luck and canniness. The vicar of Letchworth at the time was the Reverend Samuel Hartopp Knapp, who, naturally enough, was keen to keep on the good side of the newly installed owner of the big house, in practice his immediate boss. Accordingly, he invited Alington to take a service in the church whenever he wanted. We can imagine Knapp’s surprise when it turned out that Alington wanted to take all the services, including the marriages and baptisms, excluding only the funerals, which joyless occasions he was content to let Knapp deal with. The hapless Knapp found himself sidelined and virtually without employment in his own church. As if that wasn’t bad enough, Alington’s approach to the services was highly unorthodox. He galloped through them, rendering them completely unintelligible, and inserted prayers of his own invention whenever the fancy took him. His sermons scandalised the neighbourhood by preaching a doctrine of free love, which must have been shocking in any context in early Victorian England, but a hundred times more so coming from a pulpit. Very soon his behaviour was the talk of the whole of north Hertfordshire, and people of high and low status from all over the area attended his services to see for themselves if the scarcely believable rumours were true. They were. Knapp had to do something. He wrote to the bishop, and, alarmed by Alington’s heresy, the bishop suspended him so that he was no longer permitted to practise as a clergyman. (But, strangely, he wasn’t stripped of the Rectorship of Little Barford, perhaps because this was in effect a purely nominal post.) Rather surprisingly, instead of just ignoring the bishop’s ruling and carrying on anyway, as you might have expected him to do, he obeyed. He took no more services in the church. His revenge on Knapp and the bishop, however, was inventive and effective. The more respectable inhabitants of the parish, most of whom had probably absented themselves from Letchworth church while Alington was taking the services, were glad that he had been banished, and returned when Knapp was reinstated. The bulk of the congregation, however, couldn’t afford to do this, since they relied on Alington, directly or indirectly, for their income. He owned everything for many acres around, and those who worked the land couldn’t risk offending him. What’s more, his services were a lot more fun than Knapp’s. They attracted all the local Gypsies, ruffians, crooks, prostitutes and ne’r-do-wells. While Knapp’s, probably sparsely attended, services were taking place in the church, Alington would, when the weather was suitable, take his own private congregation into the churchyard. There he would lead them in making as much noise as possible, by singing hymns and bawdy songs and by general rowdiness. Free beer and brandy helped to fuel the fervid atmosphere. If his intention was to disrupt the staid offices taking place in the church and punish Knapp for daring to presume to get the better of him, we can well imagine that he succeeded. There’s both a relishably comic and a near-sinister side to this. On the one hand, I can’t help being amused by the thought of Alington’s cheerful iconoclasm challenging the social and religious orthodoxies. Almost certainly Alington had no political motives or interest, but 1838 was when the Chartist movement, a mass working class campaign for political reform, was just getting underway. His encouraging the insubordination of the poor of the parish, leading them to openly defy their social superiors, was like giving the whole Establishment a well-deserved (and richly funny) bloody nose. On the other hand, we have to feel sorry for Knapp – he’d done nothing wrong, and was being harassed and publicly humiliated. Alington was using his wealth, which he’d done nothing to deserve, as a means to his own selfish ends. What’s more, while the Chartists were at pains to present themselves as rational, respectable and peaceful, Alington was creating a mob, a potentially dangerous enterprise. How long these directly confrontational counter-services in the churchyard went on doesn’t seem to have been recorded. After a while, and certainly when the weather was inclement, Alington took his ragtag followers into the Hall, and conducted his irreverent ceremonies there, where they continued until his death in 1863. The room in which the services took place contained two pulpits made from the hollowed out trunks of elm trees which had been blown down in the park, and boards displaying the Ten Commandments. Music was provided by an out of tune piano (nicknamed by Alington ‘Tiddlee Bump’), an organ and two large rather unmusical music boxes. As the congregation gathered, Alington would go from instrument to instrument, playing each in turn, creating a truly unholy row. The congregation being adequately supplied, for the time being, with bodily comforts, Alington would retire into a cupboard which he used as a vestry. But he would emerge dressed not in priestly robes, but in a leopard-skin (which allegedly he’d shot himself in Africa some years previously). Dressed in this extraordinarily striking, and extraordinary, costume, he would climb into one pulpit and, for the spiritual well-being of those gathered, read some love poems, then cross to the other pulpit and read a short story. Alington’s eloquence was of the ‘enthusiastical’ order. His words poured down into the hall as in a cataract. Towering though he did literally and mentally above the heads of the people, he never preached down to them. All that he had learned at Balliol [College, Oxford, where he’d taken holy orders], all the knowledge he had gathered since – the Fathers, the Classics, the Poets, the Divines – were fitly or fantastically compacted and joined together into the impromptu torrent of his speech as he denounced the Established Church that had disestablished him, as he fulminated against Samuel Hartopp Knapp, and as, in his accustomed peroration, he unfolded the marvellous riches, the blissful consolations and the heavenly sanction of human love. I have been told that in the crisis of his sermon he would be beside himself. He would thump the brass-bound green morocco book of Common Prayer which served him for a desk. His crimson face would stream with perspiration; and as a final triumphant gesture – at a clinching point in his crowning argument – he would catch hold of his sandy wig, wave it wildly in the air, and hurl it into the hall. Dramatically, one feels, the services should have ended there. But, for the congregation, the best was still to come. In a trice, Tufnell [Alington’s bailiff and shepherd] and King [his groom] would clear the forms out of the hall. Some of the gypsies, whom Alington allowed to camp permanently in Drunkards’ Lane and Bantam Close, would take the gallery with their fiddles; and dancing would begin. I have talked with two of those dancers, and as they described the scene to me it made me grieve that Samuel Lucas [the artist] should not have set it, for ever, upon canvas. One has to imagine it now in the half-light of memory: the whitewashed and panelled hall; the flushed and happy faces of the dancers, seen for a moment as they catch the light from the tallow-dips in the sconces and from the lanthorns swinging from the roof; the ebb and flow of the music, the winding and unwinding of the dance; the mad parson beating time with the tail of his leopard-skin and chanting at the top of his voice; his two acolytes and men of all work serving beer and brandy in the corner. What more could an artist ask for in an English interior! As Hine puts it, Alington ‘was eccentric not only on Sundays but on week-days too.’ He was, at least in theory, a gentleman-farmer, but, being not short of money, had no interest in farming efficiently or profitably – quite the opposite. He rewarded his farm workers with beer regardless of how badly they did their jobs. This was partly because of his feud with Knapp. At the time tithes were still payable to Rectors, either in the form of one tenth of the farm’s produce or the equivalent cash value. So the more Alington’s farmland yielded, the more Knapp would get. Hence Alington was content to produce as little as possible; he began to turn his arable land, which had been growing vegetables, into grassland to avoid having to surrender his potatoes and cabbages to the hated priest. Sheep were moved onto the grass, and Knapp claimed one tenth of their wool. Outraged and determined not to be beaten, he got rid of the sheep and replaced them with bullocks, to make it harder for Knapp to get his share of the produce of the land. His benevolence towards his workers often took strange forms. In 1851, at the time of the Great Exhibition in Hyde Park, there was concern that visitors to London who had never been there before (probably including most of the inhabitants of Letchworth) would be unable to find their way from Kings Cross (via the newly opened Hitchin station) to the exhibition. He caused to be constructed a timber map of the relevant London streets on his parkland, and tried to teach his employees how to navigate their way through the capital. In the end, however, he declared that they were all too stupid to find their way safely there and back, and refused to let them go. But his grandest educational and engineering project was to make nothing less than a scale model of the lands and seas of the world in a nearby pond. The continents were made, presumably, by piling up soil and stones, and Alington would sail around them in a little boat, perhaps a punt, lecturing his probably bemused labourers on the finer points of the world’s geography. The pond was by the Cambridge to King’s Cross railway line, and passengers in the passing trains were probably equally bemused by Alington’s antics. In addition to these, he carried out more orthodox building projects, in the form of a west wing and a tower extending the originally Jacobean Letchworth Hall. These still survive, probably much altered, in the Hall in its present incarnation as Letchworth Hall Hotel. All (or nearly all) of his more outlandish landscaping schemes will have vanished under housing estates decades ago, however. He had had nine children with his first wife, Eliza, who he married in 1822; when she died in 1838 they ranged in age from teenagers to toddlers. We must assume that they lived in Alington’s other house in Little Barford, and were cared for by nannies and governesses. But he did not intend to ignore his own homilies on the pleasures of the flesh, (he had a collection of paintings of female nudes, which he called ‘my naked ladies’, and which he enjoyed exhibiting to his guests of low and high estate), and in 1841, aged forty-six, he married again. His chosen partner (and it was very much the case that he chose her – she seems to have had little say in the matter) was the twenty-one year old Elizabeth Tufnell. She was one of his agricultural labourers, and illiterate her whole life. He plucked her from the fields, and their (childless) marriage seems to have been happy enough. She liked to be called ‘Lady Alington’, a small and harmless eccentricity compared to those of her husband. Shooting and drinking were the other corporeal delights that he pursued. (He read, painted, sewed, played chess, the violin and hand-bells too.) He liked to be pulled around his estate sitting backwards on a dung-cart, from where he’d fire at rabbits. He had an exceptionally good head for alcohol, and took delight in drinking his guests under the table, then sending them on their pie-eyed way. He also liked to go into Hitchin and Baldock, the nearest sizeable towns, of an evening while wearing his Sunday best leopard-skin, lurk in the shadows, and then jump out to startle the unsuspecting inhabitants. (Hine’s comment on this is milder than it might have been: he describes it as merely ‘somewhat odd in a magistrate and a member of the Hitchin Board of Guardians’.) One night he had his comeuppance when he trod on the leopard’s tail, fell over and fractured his leg. 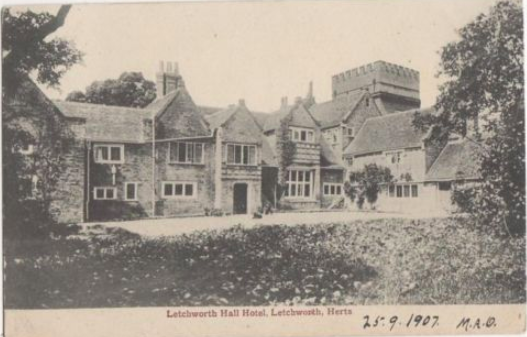 George Jeeves of Hitchin once had occasion to go to Letchworth Hall to see Alington on business. He was perturbed to find some servants carrying an open coffin around the garden. He was even more perturbed when Alington’s head popped out of it. ‘You see, Jeeves,’ said Alington, ‘I’m getting ready.’ In fact, when what proved to be his final illness arrived, and death seemed to be impending, his behaviour was irascible rather than stoical. When he was on his death bed in December 1863 a doctor from Hitchin was called to attend on him. He prescribed medicine, which Alington refused to touch until his servant, James King, had tried it for three days. Subsequently the doctor attempted to get Alington to down the no doubt foul-tasting potion; Alington cursed and threw the medicine bottle at the wall with his remaining strength, shattering it, and called for a glass of brandy. This was brought to him; he drained it in one go, fell back with a contented sigh, and promptly died. I’m in no hurry to die, but when I do go, something like that is how I’d like it to happen. In 1903, forty years after Alington's death, Letchworth Garden City was founded. It soon gained a reputation as a haven for what were then seen as cranky ideas: socialism, vegetarianism, 'rational dress', teetotalism (alcohol was not sold in the town centre until 1958) and various oddball religions. Nowadays, while cherishing its history, it is as mainstream as any other pleasant and prosperous Home Counties medium-sized town, but it should celebrate the life and work of its original crank, the Reverend John Alington. This is the account from which all subsequent writings about Alington derive. Hine was born in 1883, twenty years after Alington’s death, so of course had no first hand experience of him, but did talk to many older people who had known him. Nick Kingsley, Landed Families of Britain and Ireland (website), and in particular http://landedfamilies.blogspot.com/2013/11/87-alington-of-little-barford-manor.html. (accessed 10th Jan 2019). I’ve discovered this extraordinary website only while I was researching this post. Nick Kingsley is attempting to tell the story of every landed family in the British Isles and their country houses. I don’t know how far through the job he has got so far (as he comments himself, if he lives to be a hundred he might just complete the task), but the amount of information he’s assembled so far is simply staggering. If you want to know what became of Alington’s children and grandchildren (at least two of whom lived into the 1960s), for example, this is the place to look. It's also well illustrated.